Yes! Bosque del Apache, New Mexico is a mecca for bird photographers. The Snow Geese and Sandhill Cranes are a sight to behold – especially when thousands of them take off at the same time each morning in late November and early December. But there are other great photo ops in Bosque… especially if you are into HDR photography. And if you have not tried Nik Software’s HDR Efex Pro, I suggest you give it a try! 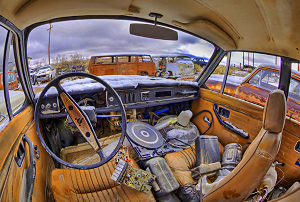 One location for HDR images is a cool junkyard around 15 minutes from Bosque. When it comes to HDR photography, you’ll get the coolest images when shooting in a high contrast situation – such as shooting from indoors to outdoors, which includes shooting from inside a car. In situations like this, you need to take several exposures to capture the entire dynamic range of the image. Here, I took five images: 0EV, -1EV, +2EV, +3EV and +4EV. When shooting HDR, keep your highlight alert on, and keep underexposing until you have no “blinkies” on your LCD monitor. Keep overexposing until you can clearly see into the shadows on your LCD monitor. 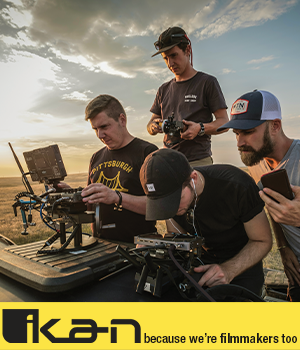 This is one of my favorite images from our HDR shoot. I used the Canon 8-15mm fisheye lens on my Canon 5D Mark II. I had been at the junkyard the day before but, because it snowed, I wanted to return to shoot in the snow – which turned out to be very cool. This is one of my favorite sunrise shots from Bosque, taken with my Canon 5D Mark II and 100-400mm IS lens. Here, it was HDR to the rescue. When shooting into the sun, and when you want details in the foreground, you’ll need HDR to reveal all the detail in the image. After processing my image in HDR Efex Pro, I used the Bi-Color User Defined filter to add some color to the sky and foreground. Here’s another sunrise shot, taken before sunrise with my Canon 5D Mark II and Canon 17-40mm lens. After processing my HDR image, I added the Duplex filter in Nik Software’s Color Efex Pro 4 to add a softness to the image. Ok! I know folks come to Bosque for the birds, so above is my favorite bird photograph, taken at “blast off” with my Canon 5D Mark II and Canon 24-105mm IS lens. To add some color to the sky, I used the User Defined Graduated filter in Nik Software’s Color Efex Pro 4. I’ll leave you with a composite – and with the idea that plug-ins help us awken the artist within. Here, I used two images taken with my Canon 7D and 100-400mm IS lens, and combined in Photoshop CS5. To remove some of the reality from the scene, I used the Midnight filter in Nik Software’s Color Efex Pro 4.